LOS ANGELES (AP) — The Edge is donating his favorite instrument to an auction benefiting Music Rising, a charity the U2 guitarist co-founded to replace musical equipment lost or destroyed by Hurricane Katrina. He's logged thousands of hours of stage and studio time on the 1975 Gibson Les Paul. The 45-year-old musician has used the guitar throughout his years with U2. "I wanted to give something really significant that would really mean a lot for me to give. It deserved something that I would miss," The Edge told The Associated Press by phone from France. 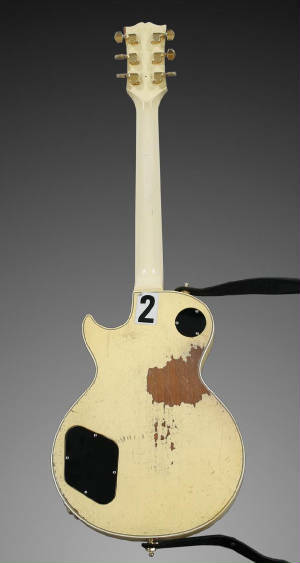 The Icons of Music auction, administered by Julien's Auctions, features 196 rock-related items, including a saxophone signed by former President Clinton, a guitar that belonged to Jimi Hendrix and an original Elvis Presley recording contract. An exhibit of auction highlights will travel from Los Angeles to Dublin, Ireland, and London before the sale ends April 21 with an event at Manhattan's Hard Rock Cafe. Fans may bid online or in person. 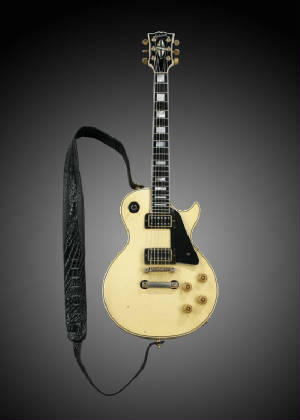 The Edge's guitar was expected to fetch between $60,000 to $80,000, according to the auction Web site. Bandmates Adam Clayton donated a bass guitar, Larry Mullen gave a pair of tom-tom drums and Bono donated a pair of Emporio Armani sunglasses. "It's some great poetry to ask the people like myself, who've earned a good living from rock 'n' roll, to donate items to an auction that would help protect and stave off the decline of the music culture in the Gulf Coast," he said. New Orleans is the soul of American music, so the Irish rocker said he felt compelled to help after hurricanes Katrina and Rita. He created Music Rising in 2005 with record producer Bob Ezrin and Gibson chairman Henry Juszkiewicz. "One of the good things about globalization is it has created a single international music community, and I feel very much part of it," he said. "So this doesn't seem like it's someone else's problem. It's really our problem, too." The Edge, whose real name is David Evans, first discovered the area's rich musical culture as a young member of U2. He was intoxicated by the city's jazz funerals, where scores of musicians parade down the street in colorful costumes covered with flowers and feathers. "Jazz came out of New Orleans, and that was the forerunner of everything," he said. "You mix jazz with European rhythms, and that's rock 'n' roll really. You can make the argument that it all started on the streets of New Orleans with the jazz funerals." 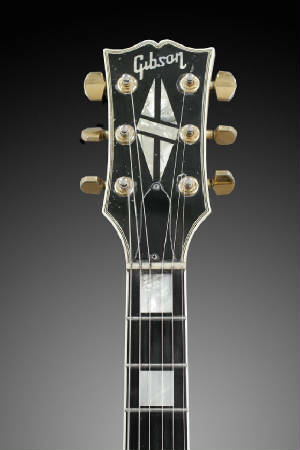 Gibson Les Paul electric guitar, serial number 203177, black leather guitar strap, rectangle mother-of-pearl inlays, 22 fret, single cut-away. The Edge's guitar work has been called ethereal and having a quality all its own. His established style of repetitive and echo-y riffs carry the heart of U2's music. His guitar playing has been noted for the use of delay (and double delay), shimmer effects, and drawing on styles from traditional Irish music. 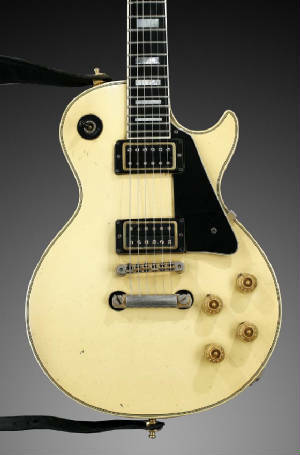 1975 Cream Gibson Les Paul Custom, or so I'm told by Dallas Schoo who checked the serial number. I bought this guitar down on 49th street in New York city in 1982.. It was the third guitar I ever bought, after my Explorer and my black Strat. I wanted that Steve Jones "Never mind the bollox" sound, so I got the same guitar right down to the colour. I never could get that sound, but I found a bunch of songs in this instrument, and have used it extensively ever since, on tour and in the studio. There are many of photographs out there of me playing this Les Paul. One I happened to notice is in our recent book "U2 by U2" on page 224. I'm in the control room of the original windmill lane studio with Brian Eno, probably adding the final touch to a song from the "Achtung Baby" record, which we mixed there. I will miss this one, not for sentimental reasons but because it's my New Years Day guitar. Dallas is going to have to get me one that sounds as good, I'm sure I never will quite get the same sound, but maybe there might be a few songs in the replacement. Edge Dublin 2007 photo credit: Anton Corbijn.